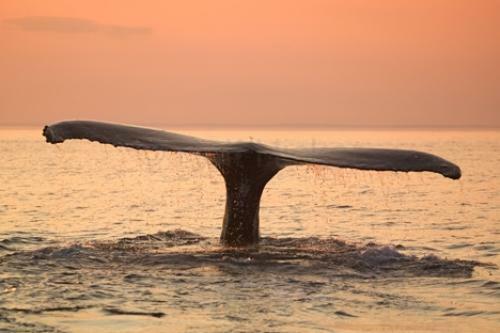 Stock Photo of a Humpback Whale Tail with beautiful sunset colors. We needed this perfect day, being low to the water requires calm seas, especially when we get closer to the whale. Just after sunset I got this beautiful Whale Tail. The water coming off the Whale Tail added the last missing bit. I photographed lots of Humpback Whale Tails, but this tail shot is my favourite. Taken of the coast of Newfoundland, Canada, a great location to do some Humpback Whale watching or a adventure travel vacation. Photo of a Humpback Whale Tail at sunset with water drops running off, Newfoundland, Canada.